We are delighted to announce the launch of our #‎Harryhausen100 logo competition! - Incorporates the tagline #Harryhausen100, in whichever fashion you think will grab the most attention. - Will be flexible enough to be used on everything from our Facebook profile picture to press releases and exhibition posters. 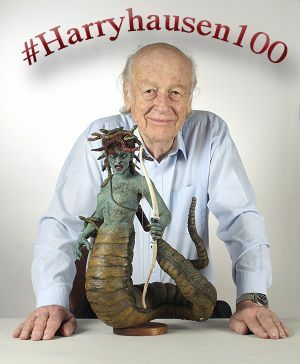 - Please submit all entries to Harryhausen100@gmail.com. The deadline for entries is May 31st 2016. There will be runner up prizes for 2nd and 3rd place entries. See comments section below for legal and copyright notes. We’re asking all fans of Ray Harryhausen, far and wide, to like and ‘share’ this news with as many people as possible! We’re so excited to see what will emerge from the fertile imaginations of Ray’s loyal fanbase, and how much he has inspired each and every one of you! Think that you’ve got what it takes, or know anybody who would jump at the chance? Please get in touch through the comments section below! (By entering the competition, entrants confirm that their entries are original to them and shall not infringe upon any third party intellectual property rights. The winner, by entering the competition, assigns the copyright and all other intellectual property rights in their work to the Ray and Diana Harryhausen Foundation (“the Foundation”) for use by the Foundation for any and all of its activities including commercial and fundraising activities as the Foundation sees fit in perpetuity. Applicants should submit only one entry and the winner and runners up will be chosen at the sole discretion of the Foundation. The Foundation does not commit to the return of entries nor will it be liable for damage to, or loss of, entries or if entries are not received. The winner and runners up will be notified by email (where an email address is given) within 14 days of the deadline for submission of entries. The Foundation will not consider entries submitted after the deadline or where the Foundation has reasonable grounds to believe that any competition rules have been breached. The Foundation reserves the right cease using or displaying the winning entry at any time and to cancel or amend the competition or the competition rules at any time.